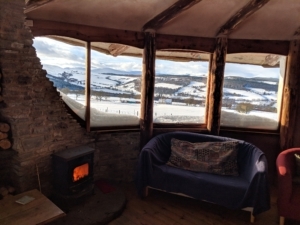 In this case study, we talk to Moniack Mhor about their innovative and sustainable Straw Bale Studio, finding out more about the conception and development of their sustainable cultural building! Moniack Mhor, Scotland’s Creative Writing Centre, is based in Kiltarlity, 14 miles from Inverness. Their programme aims to support developing and established writers, and they host courses, workshops and retreats around 46 weeks out of every year. Celebrating 25 years since its opening in 1993, the centre was initially funded through two sponsored ‘Poethons’ – 24 hour poetry recitals – in Edinburgh and London. Moniack Mhor were the 200th Scottish cultural organisation to join the Green Arts Initiative, becoming members in early 2018. However, they are not new to trying to reduce their environmental impact. In fact, they have been working on increasing the sustainability of their work for many years, having constructed their Straw Bale Studio – an eco-building – back in 2013. 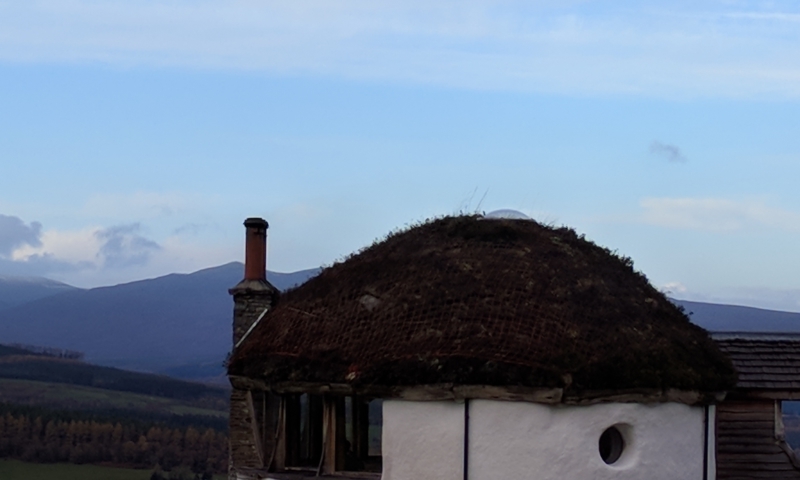 We spoke to Sarah Kinghorn, Moniack Mhor’s Green Champion, and Rachel Humphries, the centre’s Director, to find out more about their green building, how it came about, and what advice they would give to others looking to do something similar. Back in 2013, Moniack Mhor was constrained by its existing building, and was particularly looking for a space to hold 1:1 tutorials, host readings and workshops, and to offer to writers on retreats as a quiet and contemplative space to write. When thinking about a potential building to meet this need, one of the staff members had joked about creating a ‘hobbit house’: a low-impact home built into a hillside, which had recently been the subject of Channel 4’s ‘Grand Designs’, made by a family in Lammas, Pembrokeshire, Wales. However, the idea took off, and quickly gained traction – Moniack Mhor successfully raised the funds for the studio, with support from Creative Scotland, The Gannochy Trust, The Robertson Trust and The CPF Trust, as well as individual donations. The studio is south-facing, enabling it to use the maximum natural light and heat possible, and allowing the chimney breast to act as a thermal storage unit. Solar photo-voltiac panelling powers a 12-volt electicity system, which makes the building energy self-sufficient and powering the lights and charging points for laptops. Straw bale insulation and a heather roof insulate the studio and help it blend in with the setting. The timber frame was made from Douglas fir, sourced from Upper Reelig Glen wood, which is managed by Kirkhill and Bunchrew Community Trust in partnership with Forestry Commission Scotland. The stone for the chimney breast and foundations came from the local quarry at Achilty and the hearth is Caithness flag stone, cut and worked by master craftsmen, George Gunn. The internal render is clay, giving a soft appearance to the interior walls. The use of electric tools was kept to minimum by using hand tools and traditional building methods. The studio, including the unique double reciprocal roof structure, was designed by Steve James, who also manage the construction. Steve brought the building to life, supported by a team of around 30 volunteers over the course of around 18 months. Throughout the duration of the project, the volunteers and members of the local community gained the opportunity to join a programme of garden/landscape/therapeutic workshops including drystone walling, attracting wildlife, polytunnel management, vegetable gardening and yoga. You can see images of the construction of the site, and of many of the different elements, on Steve’s website, Envisioneer.net. During the construction phase, Moniack Mhor also developed the grounds of the centre in partnership with the local community and the Beechgrove Garden. This included building beds of local plants, planting soft fruit, creating a paved, welcoming entrance, building a dry stone storytelling circle with a central fire pit and creating a path network to enhance accessibility. Now the Straw Bale Studio is a key part of Moniack Mhor’s year-round activities and events. It costs nothing to run (except for the fuel required to stoke the fireplace), and it is a key part of their site. As with any building-based project, it was difficult to anticipate how the end project would look and feel. Initially conceived to have several internal spaces (to allow multiple meetings to take place at the same time), the acoustics within the structure meant that this wasn’t possible, and it can only function as a single room. However, this has opened up further opportunities for the building – the space is so well insulated that it makes a great recording studio! Managing the project and the many volunteers was a big logistical undertaking for the Steve and the organisation, particularly as Moniack Mhor continued their existing programming of work at the same time: communication between the building team and the Centre Director was key! There is still a learning curve as how a straw bale building behaves, and the centre has had to learn how to care for this unusual building. At the moment, they are working to repair their living roof, which like any natural landscaping, with require maintenance from time to time (you can help support this by donating to the centre). The building has become a catalyst for Moniack Mhor’s other environmental work, expanding and enabling alignment with other parts of their programme that focus on nature and sustainability – they now run weekly guided nature walks around their site and are about to start hosting fortnightly Earth Hours to appreciate their physical surrounds. They have the ongoing ambition to continue to integrate their programming work with their local environment, including the continuing development of their Community Garden Project. The space has had unexpected uses as a result of its unique nature: it has proven to be particularly suited to youth events, due to the informal and fun character of the building, and is ideally suited to musical events and songwriting courses. The space has become a valuable community resource – when not used for events organised by Moniack Mhor, the space can bemade available to the community for activities and get-togethers. The Straw Bale Studio has also inspired further buildings! Moniack Mhor are currently considering extending their existing main house to increase the accessibility of their spaces, and are thinking about using the same principles or materials for this new design. One of their staff members is also currently in the process of building her own eco-house! Do your research! During the planning stages, Rachel visited other similar constructions in Wales, and worked closely with Steve before embarking on the construction of their straw bale studio. Work with an experienced project manager! Aim to build up a good rapport with the team delivering the project. Steve and Moniack Mhor worked with two structural engineers in the planning stages, one in Wales and one in Scotland. Make sure to build in a realistic timeframe for the work…and then some! It can be difficult to anticipate and plan for things outwith your control. For example, factor in the time of year – frost can set in as early as September at Moniack Mhor and this can lead to problems with cracking and bossing when liming the exterior of a building. Plan for the whole life of a project! In the case of the studio, thinking about the ongoing maintenance of the building is key to the long-term success of the project, and should be considered from the time of design. 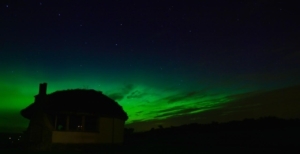 Moniack Mhor are a member of our Green Arts Initiative: a networked community of practice for Scottish cultural organisations committed to reducing their environmental impact. It is free to become part of the community, and there are lots of resources and case studies (like this one!) to support #GreenArts organisations. 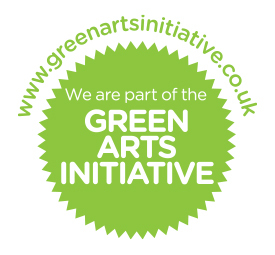 Take a look at our Green Arts Initiative page for more information. All images are from Moniack Mhor.